>> to politics and the gop presidential race . things got very heated during last night's debate out in las vegas . nbc's political director and chief white house correspondent chuck todd has the blow byeby blow. chuck, good morning to you. >> reporter: good morning, matt. well, look, apologies for the cliches but last night's republican debate, the gloves came off and it turned into a good old-fashioned fight night in vegas. >> because you hired illegals in your home and you knew for it -- about it for a year. >> reporter: struggling to get back into the race, rick perry took an answer about his health care records to level a personal attack on front-runner mitt romney that caught everyone off guard. >> the idea you stand here before us and talk about that you're strong on immigration is on its face the height of hypocrisy. >> reporter: perry referring to this 2007 " boston globe " report that romney for a full year used a lawn service that used un undocumented workers. >> i don't think i've ever hired an illegal in my life -- i'm looking forward to finding your facts on that da. >> rick, you had the floor. i'm speaking. >> i'm speaking. you get 30 seconds. this the way the rules work here and then you get 30 seconds to respond, right? >> you knew you had illegals. >> will you please work? >> are you going to keep talking? >> reporter: the exchange was raw and personal. >> a tough couple of debates for rick and i understand that so you're going to get testy. [ cheers and applause ] but let's let -- i'll tell you what, let me take my time and then you can take your time, is that all right. >> we hired a lawn company to mow our lawn and they had illegal immigrants were working there. when that was pointed out to us, we let them go. -- do you have a problem with allowing someone to finish speaking and i suggest if you want to become president of the united states you got to let both people speak. >> reporter: the debate began with everyone taking shots at herman cain and his 9-9-9 plan. >> go to new hampshire where they don't have a sales tax and you fixing to give them one. >> this is an example of mixing apples and oranges . >> no, he was not. he was mixing apples and oranges . >> and i'll get a bushel basket of both because i'm paying taxes. >> you don't have credibility when it comes to repealing obama care. your plan was the basis for it. >> that's not what you said. you said you're speaking for everybody. took it out of your book. >> rick, you had your chance. let me speak. rick, you had your chance, let me speak. >> you're out of time. >> he ate into my time. >> i haven't had a chance to respond because you interrupted me the entire time i was trying to speak. >> well now you understand why these next poll results are about to debut are what they are and what happened at last night's debate. the new marist polls herman cain is ahead. rick perry trailing badly at 11%, florida, another important primary state, it's mitt romney at 30%, herman cain at 29%. rick perry at 9%. 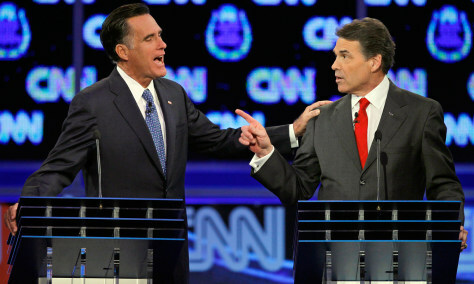 you understand why rick perry felt he had to go after romney and why everybody felt they had to go after romney and cain.